How to know if a wombat is ready? HOW DO WE KNOW A WOMBAT IS READY FOR RELEASE? 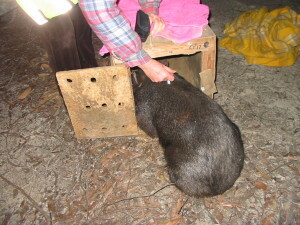 There are different ways to release a hand raised wombat and if you can answer YES to the following questions your wombat should be able to make a good adjustment to life in the wild. Is it the right age? It is best to release before fully mature, more like their late teens. This enables them to be accepted more readily in the wild. Male wombats approaching maturity can be quite aggressive and may encounter hostile competition whilst trying to establish their own territory. 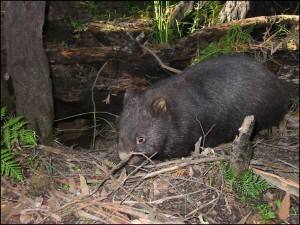 Younger wombats are more likely to adapt to a new environment. They need to be 20 – 25kgs to cope with any wild adult encounters. It is likely that in the first month of release the wombat will lose some body weight due to stress and finding a new food source. Is it displaying the right behavior? Snorting and signs of aggression if approached. Lip smacking, squelching and trembling with anger and frustration are typical male signs of maturing. Is it eating food it will find in the wild? Mainly grasses and grass pellets (it is almost impossible to get to a good weight on hand picked grass alone) Barastoc Calm Performer Pony pellets are an ideal grass supplement. 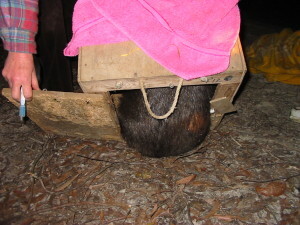 Has your wombat been housed correctly? 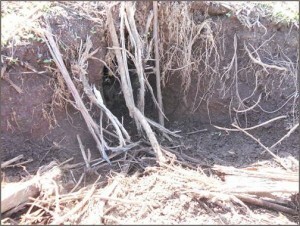 Large enclosure with deep under ground burrow where it is able to sleep undisturbed during daylight hours. As a carer you should be prepared to do followup visits for a period of time after the wombat has been released. A small amount of supplementary food/water is a good idea. I have observed that hand reared wombats can take up to three months to acclimatize to life in the wild. Enables the wombat to adjust to life in the wild at their own pace. 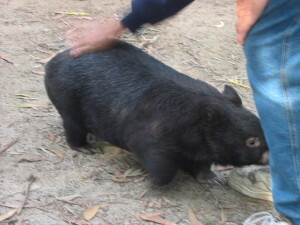 A soft release can reduce stress as the wombat has the security of knowing its surrounds and support feed can be given until the wombat adjust to foraging for itself. 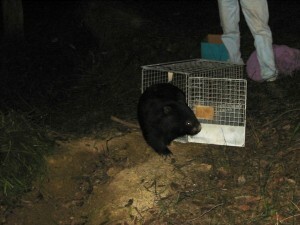 Soft releases are usually done from a large property in a remote location where the wombat has been raised. 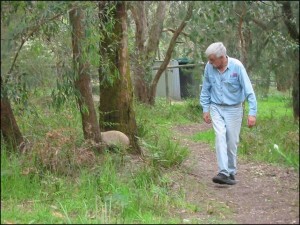 During rehabilitation, time should be taken to walk the wombat to familiarize it with the area. Wombats in this situation can often be released at an earlier age (around 18kgs) They need to be at least this size to cope with any adult encounters. Do not walk the wombat near danger zones – ie. roads and farming land. This is especially important while the wombat is still young and “at heel”. 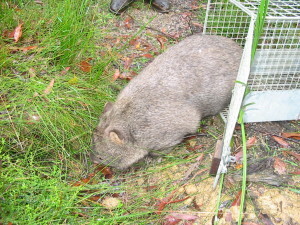 Wombats of this size tend to stick to the area they have been shown. Remember once the wombat is ready to “go it alone” it may disappear straight away or within a few days. 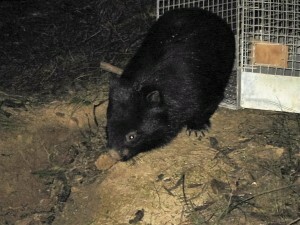 Most wombats return within a few days to check everything is ok at home. This behavior may go on for some time with the absent periods becoming longer. Others of course may decide to stay indefinitely and if this is the case this location may not be suitable for another wombat for many months or even years. Subsequent release would need to be done elsewhere. 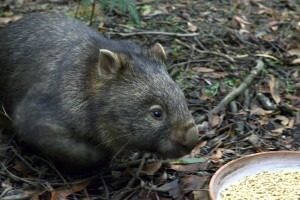 Another option could be a landowner that has an ideal property and is keen to be involved and prepared to help out with support feeding after the wombat has been released. Visits to this property and walks “at heel” while growing up would be an ideal way to acclimatize the wombat. 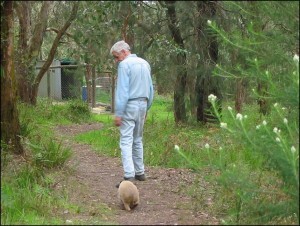 Soft releases are favored by many carers as the wombat can easily make it’s way back if assistance is needed. 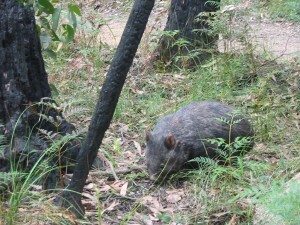 This has been the case when a hand reared wombat has been under attack from wild wombats it has come in contact with. On other occasions hand raised wombats that have been unfortunate to become infested with mange have returned home and been treated. If you choose a “Soft Release” remember that a wombat can travel up to 4 kms a night foraging for food. If you only have a 10-20 acre property you need to think about what lies beyond your boundaries. How many wombats can be released from this property? 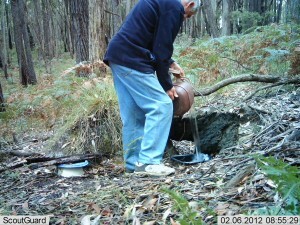 As carers we should aim to prepare our wombats to cope with this type of release. 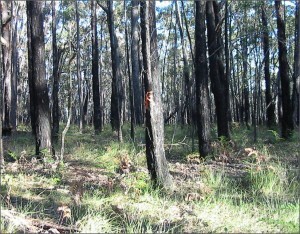 Suitable location in State Park, large reserve or private/public land where permission has been granted. Not too close to roads and public access. Hand raised wombats that are to be released this way are not taken on walks as they are being dehumanized and with an adequate enclosure they should be content with their surroundings until nearing the age for release (2 years or 25kgs). 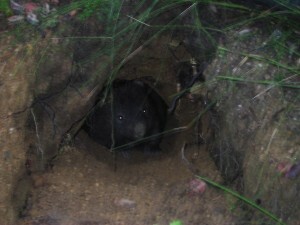 Wombats that are behaving as wild wombats, staying below ground during daylight hours and shunning human contact are an indication of an animal well prepared for a supported release. This type of release may still require weeks of follow up support. I have observed that hand reared wombats can take up to three months to acclimatize to life in the wild. 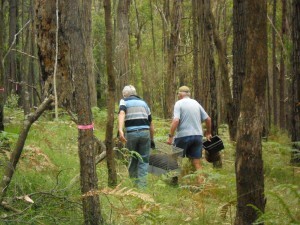 Only appropriate for an adult rescued wombat or wombat needing to be relocated. This may be the only option when an animal needs to be relocated (found in someone’s carport in a new housing estate etc.) where it’s home territory is unknown or no longer exists. 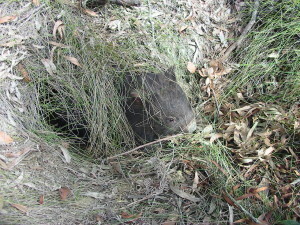 A safe location with suitable habitat and burrows will give the wombat a good start. 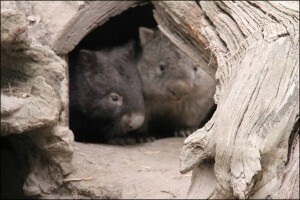 Wombats in this situation usually move on immediately as they will be unsettled and looking for a new territory. Try to keep something in mind for these occasions. 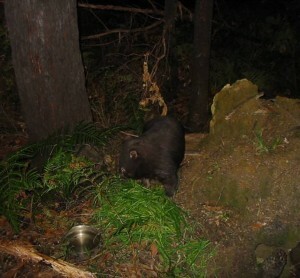 An adult wombat which is in care short term, as a result of sickness/accident should be released where it was found or as close to its home territory as possible. TO RELEASE AS BUDDIES OR NOT? 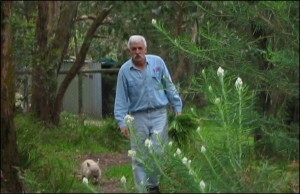 When I started raising and releasing wombats 27 years ago I thought that it was best to release wombat buddies together. The theory was there would be safety in numbers. My husband and I would look for an area where there were at least two burrows close by and we would release the wombats together. Over time we came to realize that this was not a good idea as one of the wombats would stay in the area and the other would disappear almost immediately, possibly driven away by the more dominant buddy. The release time is stressful enough for the wombats, they don’t need the added pressure of one of them being pushed out. We observed different wombat behavior as they approached the age for release and we began to appreciate that maybe both wombats weren’t ready at the same time. 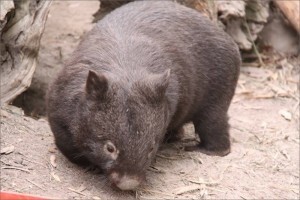 Usually one of the wombats will mature a month or two earlier than their buddy. By the time a wombat is 16 – 18 months old (the age when it would be leaving it’s mother) it is developing natural wombat behavior. At this age they are starting to show their independence by wanting to be alone. Watch out for a change in behavior. 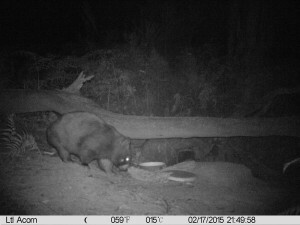 This may be evident with one of the wombats staying in the burrow while the other one is up during daylight hours. We have discovered that the wombat under ground is the more mature animal, showing its assertiveness by not wanting to share the burrow. 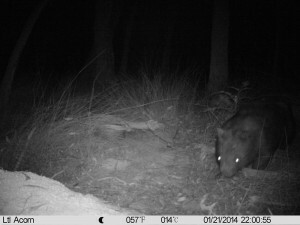 This wombat is showing signs it is ready to go it alone. The buddy that is unsettled and above ground during daylight hours sometimes showing aggressive behavior is actually not the one ready for release. This behavior is a result of the stress of not being able to get underground. The more mature wombat may start biting the buddy on the rump and this can be quite stressful. Sometimes this will resolve over a couple of weeks and things will appear to be alright for a while. If you see this type of behavior you need to be getting ready to release the mature wombat. The buddy may take another month or so before it is ready to go. FINDING A SUITABLE RELEASE SITE. BE PREPARED Finding a suitable location can take time (4 – 6 weeks) as there are many aspects to be considered. So give yourself plenty of time to be able to monitor the area you have chosen to make sure it’s suitable. It is safer and you can achieve more if you work as a team. This is especially relevant if you are planning to release in a State Park (permission required) or bush land you are unfamiliar with. Always walk on tracks that have been worn down by local wildlife, you aren’t so likely to step on a snake without seeing it. 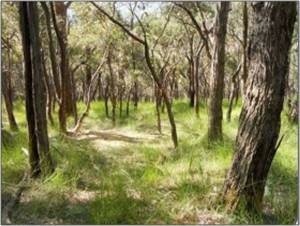 Lots of fresh scats in an area may indicate a perfect location and if so it is possibly well used with too many wombats already in residence. Don’t use this site! Keep looking, maybe at the base of a fallen tree or along an embankment, look for mounds of disturbed or flattened soil which may indicate an excavated burrow. A GPS is very handy when locating burrows. If you aren’t lucky enough to have a GPS tie some fluro tape to a nearby tree when you have found what looks like a suitable burrow. Look for something prominent that might help you to find this spot again. It is always best to find a few burrows in an area. 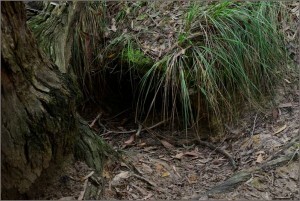 An untidy burrow (lots of sticks and leaf litter in the entrance) does not necessarily indicate that the burrow is not being used. 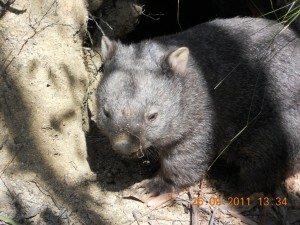 Like us, some wombats don’t mind their burrow looking untidy, whereas others like it swept clean. Cover the entrance to the burrows with some bracken or twigs. This way you will get an indication if they are being used. 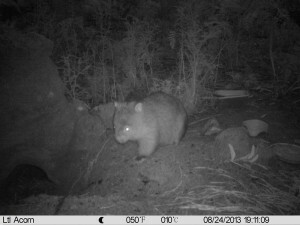 This is not invasive to the wombat and will be pushed out of the way if the burrow is being used. You will need to check these burrows over the next few weeks to see if there has been any disturbances. If the burrow remains untouched, then this could be a good starting point. 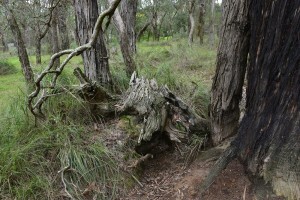 Old unused burrows are an indication that wombats have lived in this location and although there may not be water close by or lashings of food it may provide an ideal starting point. The last thing you want is your teenager bashed up the first few weeks on their own. Some support feeding and water for a few days, weeks or months will enable them to explore and enlarge their territory and become worldly wise. 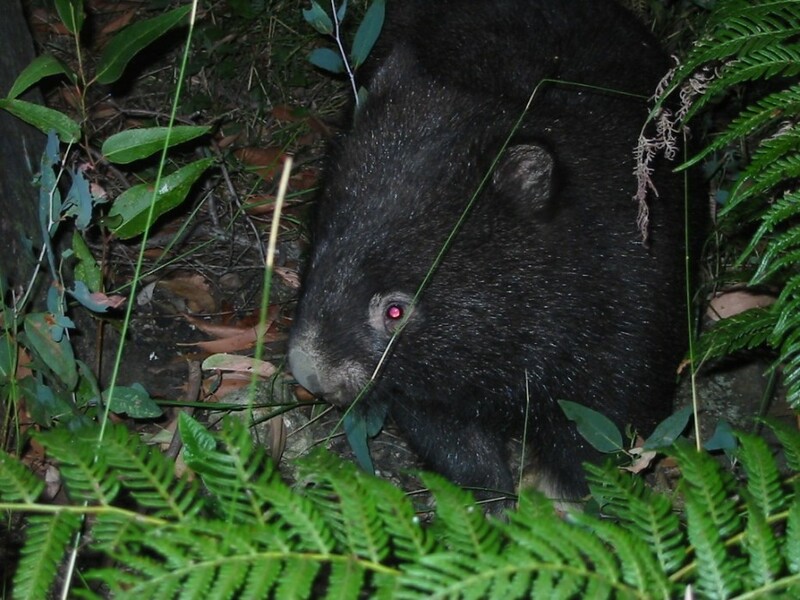 Check (every 2nd day) for the first few weeks and you will soon know if your wombat is nearby. Just because you thought it was a great burrow they may have found their own which is better. 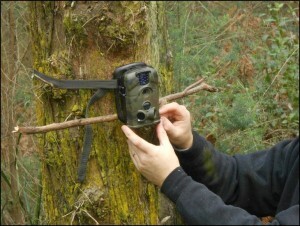 Motion sensor cameras are a great way of finding out what is happening at the release site and if the site is in a remote location the camera can be left out over a period of weeks. This gives you a good indication of the wombats movements. The Release – Daylight or Dark? 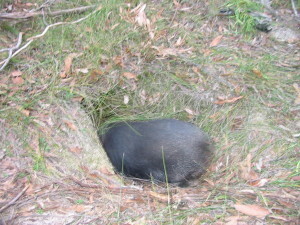 This is often decided for us as the wombat may not be coaxed out of its burrow in daylight hours. 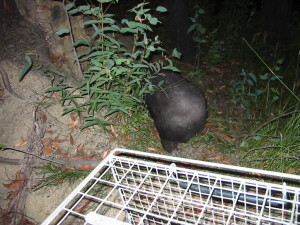 Most releases will occur at night as this is the natural active time for wombats. 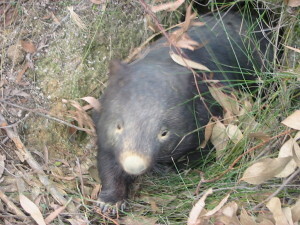 There is a theory that if your wombat is released in the morning, accepts his new burrow and sleeps in it all day he will have some sense of belonging and will settle more easily. Each wombat will be different so you need to be prepared for both options. It is easier to find the burrow site in day light. Daylight allows you more time to watch and observe what is taking place. 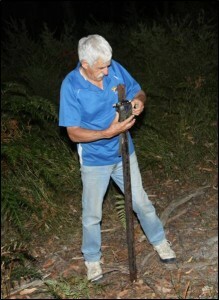 A night time release means you have to be well prepared, knowing exactly where your release site is. 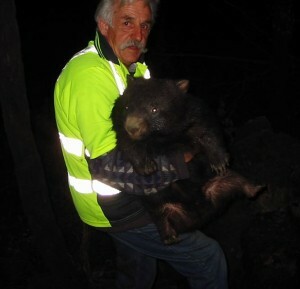 Everything looks different after dark and it is hard work stumbling through the bush transporting a heavy wombat. Your wombat is more alert at night and can start renovating his new burrow and become acclimatized to his new surroundings straight away. Place plenty of marking tapes along the track so you can find your way. (These can be put in place before hand and taken down the next day.) Always be discreet and don’t leave noticeable evidence of your special spot. 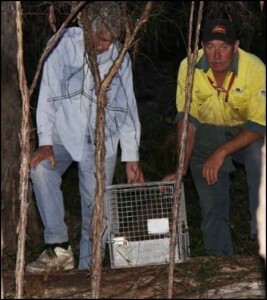 When you arrive at the release site place your transporting cage facing the burrow. Don’t confuse the wombat by fussing over it. Open the cage and step back. It may take a few minutes for the wombat to realize it’s free. 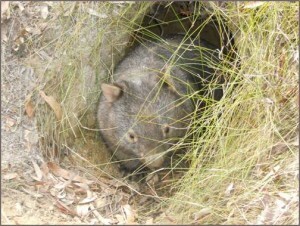 Wombats can’t resist a burrow and disappear very quickly. Sometimes they reappear just as quickly snorting and shaking themselves vigorously. 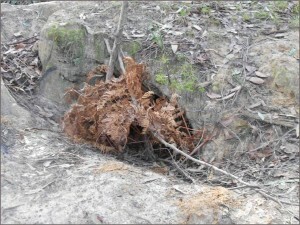 Often an unused burrow will be housing some opportunistic ticks which are lining the entrance of the burrow waiting for a new host. It’s a good idea to dose your wombat with some pour on Frontline or Cydectin when it is released. This will work as a preventative for the first few weeks. Most wildlife are host to a few ticks and this is quite normal and the animals adjust, it is only when there is an overburden/infestation that problems occur. Try spraying the entrance of the new burrow with Permoxin (available at vets) a few days prior to release. Gradually explore the surrounding area. Set up a container with pellets (a plastic bucket lid is ideal to place on top of feed bowl, weighted down with a heavy object). Set up another with water (the container will need to be stabilized by digging it into the ground). Retreat when the wombat is oblivious to your presence (you may be able to observe from a distance). DO NOT interact with the wombat during this time as you will only confuse it. Be confident that you have prepared your wombat to adjust to life in the wild. This can sometimes be the case when you have read the signs wrongly. The release needs to be tried again in a few days or weeks, you will know when the time is right. Each visit will familiarize it with the new surroundings and it will become more confident. This is usually done the following day. Don’t be surprised if the pellets are untouched. There is no visible evidence that your wombat is nearby. Often the wombat will go walk about for the first few days, feeding on new grasses and roots and may well be finding a better burrow. In two or three days it may have made its way back to the release site and be ready for a treat of pellets. It is advisable to do follow-up visits every 2 – 3 days for the first couple of weeks then start spacing your visits further apart. 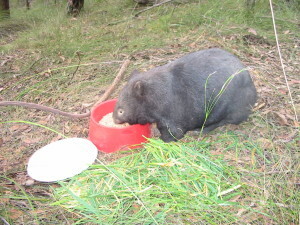 Support water and a small amount of pellets for the first few weeks may be appreciated while your wombat is finding a new food source. 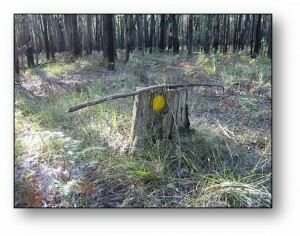 If there is no sign of the wombat this can be considered a good sign. A well adjusted wombat should be staying underground, especially during daylight hours. If you do see your wombat do not interact with it. The wombat should be wary and may even snort at you. Take this as an indication of a job well done. 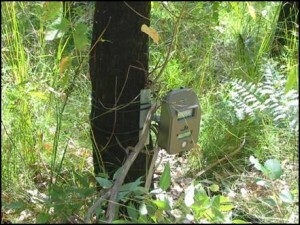 A motion sensor camera is ideal at this time as it will allow you to observe your wombats behavior.